In my first go-round with this article I noted that, with the bewildering mélange of tea varieties and a myriad of other confusing terms, a tea dictionary might be a handy item to have on hand. Though I wasn’t aware that such a thing existed, my esteemed editor pointed out that tea authority James Norwood Pratt has already done us the favor of penning one. As I noted in a previous article at this site, which took a look at the arcane tea term Bohea, there are a number of such terms that were in common use at one time but which are mostly regarded as curiosities today. Take Hyson and Singlo, for example. While you may actually find a few examples of the former variety of tea to this day, Singlo, as far as I can tell has been relegated to the status of historical curiosity. Hyson, as the story goes, was named for Phillip Hyson. He was a director for the East India Company, a firm that was a key player in the early days of the tea trade. I’ve located magazine advertisements for ” superfine Hyson” and “Cowslip Hyson” dating back as far as 1729 and if you look hard enough you might find even older references to this once popular variety of Chinese green tea. It’s interesting to note that of the estimated 240 chests of tea that were destroyed in the Boston Tea Party a little more than five percent were of the Hyson variety. 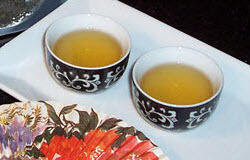 Though pretty much unknown nowadays, nearly a fourth of the Tea Party tea was Singlo. According to some sources this was because the East India Company was overstocked with this particular variety at the time and was trying to offload it on the colonists. For more on tea (and coffee) during the colonial era, look here. Singlo was also a green tea, though apparently with larger leaves than Hyson, whose leaves were typically long and were twisted during processing. Though Hyson was picked early Singlo was harvested later in the season. There are references to Singlo as far back as 1689, in an account by traveler John Ovington, who also makes reference to such Chinese varieties as Bing and Bohe (Bohea). For more historical perspectives on Hyson and Singlo, be sure to take a look at these works from 1813 and 1848. “Young Hyson” was one of my favourite green teas many years ago. Used to buy it in the late 1980s/early 1990s at Rowe-Manse Emporium in Clifton, NJ, which had a wonderful gourmet shop featuring a huge selection of loose leaf teas. Hyson did seem to fall out of popularity some time in the 1990s. Thanks for the details and the memories, Bill! I’ve really enjoyed your columns and I am learning a lot – thanks!